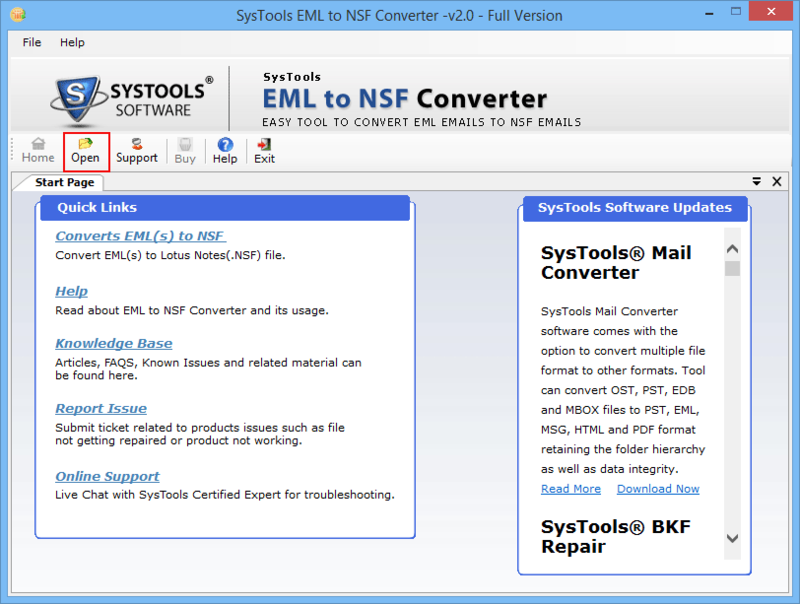 EML to NSF Converter application is a standalone and secure solution to combine single emails as Notes database storage. The EML to NSF convert tool features successful conversion of bulk EML files into Notes NSF database for added convenience. It is possible to convert multiple Lotus Notes EMLmessages toNSF file. Software automatically detects system directories and allows you to select folder(s) storing EMLfiles to be converted into aNSF file each. Also, save theNSF at source (DXL) location. Convert EMLfiles intoNSF file format with no application dependency. The software is supported to work on all available versions of Windows OS. It requires neither IBM Notes nor Domino Server configuration to function properly. When you export EML file to NSF format, it is possible to view the contents of the source file before conversion. The Export EML to NSF tool gives a preview of the EMLfile - email body contents, associated attributes, and attachments. HTML formatting of the EML files can be maintained in just one click when you transfer EML files into Lotus Notes NSF. You can either Enable or Disable the maintenance of HTML formatting in the EML file(s) being converted to NSF database as per your requirement. The output generated after conversion of a mass EML files in NSF file format, can be renamed. You can choose and decide for a name according to your preference when you want to convert EML into Lotus Notes NSF. Q. How can I successfully convert multiple EML files into Lotus Notes NSF? Ans: The EML to NSF Migrator introduced the export of an EML file of RFC 822 standard format into NSF, a database file extension. 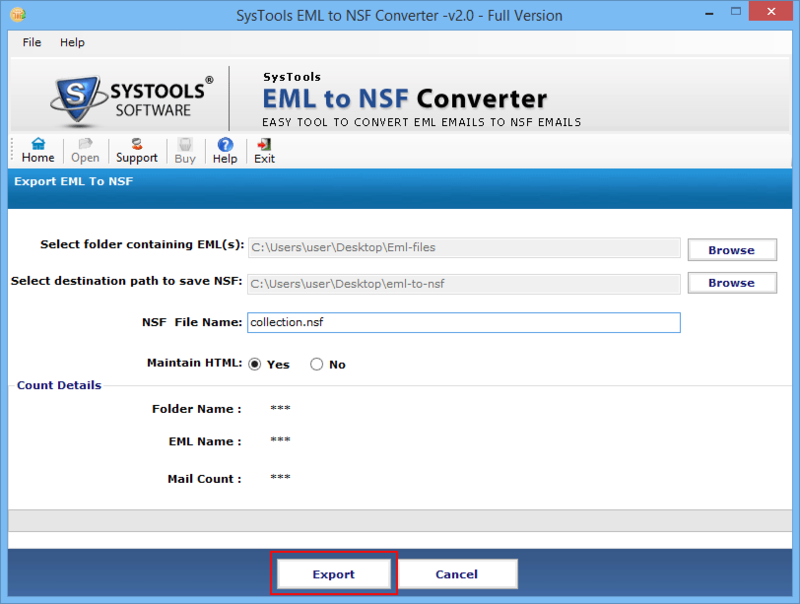 You can make use of the tool to convert a bunch of EML files into NSF database at once. Q. 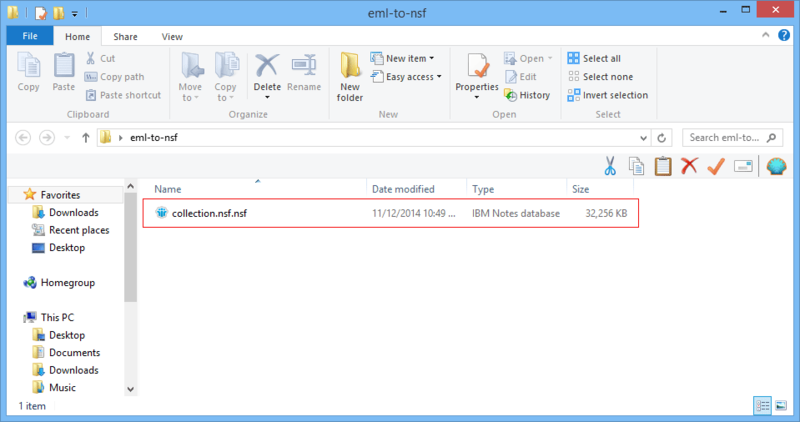 How to pull back EML files created from a Notes database? Ans: Manually, there is no such way, but by using EML to NSF Converter application, you can successfully convert EML files into a newly generated NSF file. Import of an EML file is not supported, but the application does understand an NSF file. 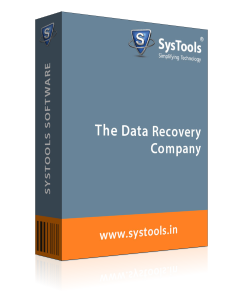 Therefore, this software is the best available solution to your issue. How to Convert EML to NSF? Step 1 : Firstly, Open a EML to NSF Converter. Step 2 : Go to open option & click on it to export the file EML to NSF. Step 4 : Go to second browse option, choose the destination path to save the NSF file. 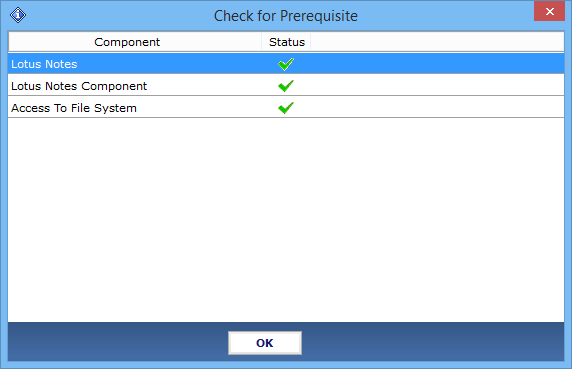 Step 5 : Now select the whether to Maintain HTML or not using Yes or No radio button accordingly. Step 6 : Go to NSF File Name option and provide a NSF file name. Step 7 : Now Go to Export option and click on it to start the conversion process. 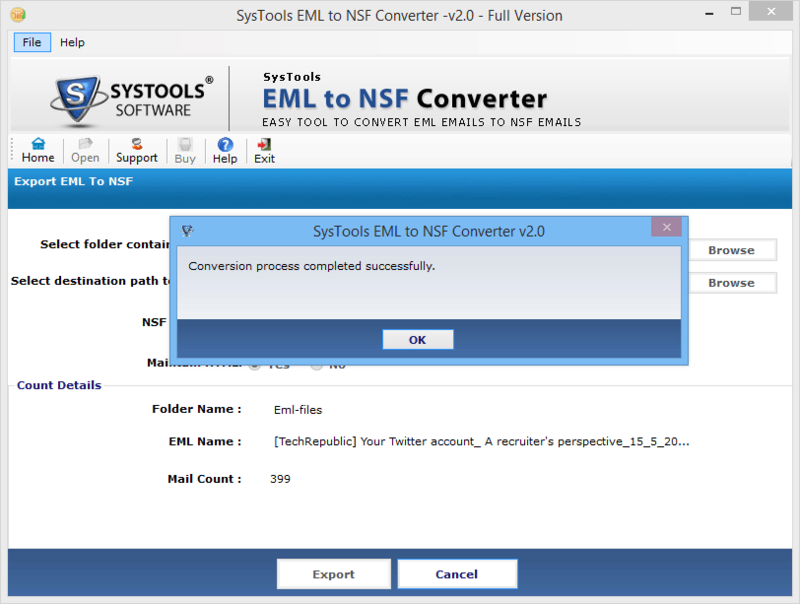 Step 8 : After completetion of EML messages into NSF file, the tool gives you completed successfully message. 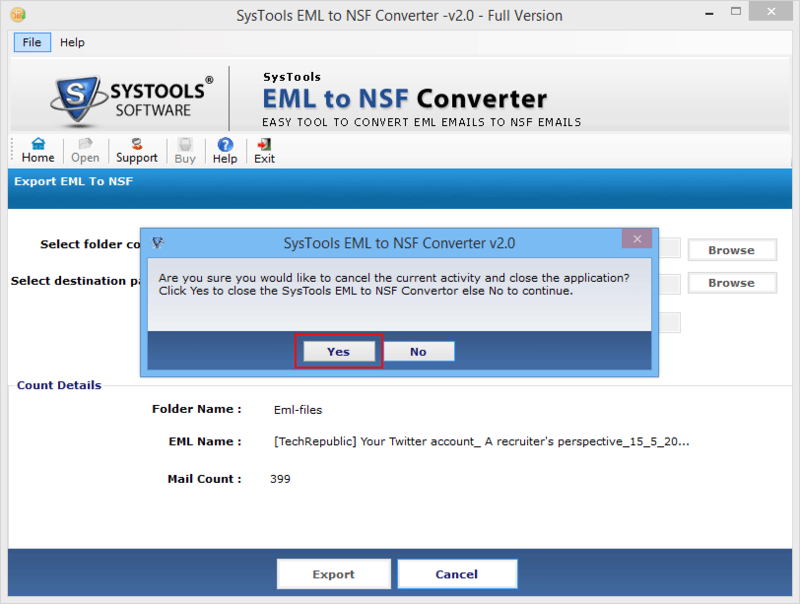 Step 10 : If you want to cancel the current activity, click on Yes to close SysTools EML to NSF Converter. Step 11 : Now, Go to destination location where you save the NSF file, select the NSF file and open it. It was becoming too complicated for me to convert EML to Lotus Notes format. Everybody kept suggesting that there would be ways but I ended up finding nothing. Thankfully, I came across with this tool and I am satisfied with the solution and brands to the fullest! When I tried to first convert EML into Lotus Notes, it seemed like the most imposible procedure. An indirect method too was unavailable. However, we discovered that someone from your organization had posted an article about the product and thus, I found out about it.